All of Brittany's beaches are free and even better, uncrowded. 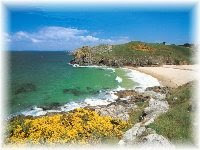 The Brittany Coastline is over 750 miles long and is blessed with a variety of sheltered sandy coves on the north coast to long sunny stretches on the south coast. The north coast of Brittany has fairytale like beaches which are made more interesing by the eb and flow of the tides replenishing rock pools and keeping the beaches clean and fresh. If you are following the GR34 (see blog entry) you will be given access to most of these lovely bays. St. Jacut de la mer - There are several beaches at St. Jacut. There is one for families with easy access, dingy hire and a small beach cafe where there are no dogs allowed and some other beaches on the right hand side of the penisula where it is a bit more dog friendly for those with pets. When the tide goes out you can walk to the l’île des Ébihen along a causeway and although it's quite a hike it's a beutiful place to visit and dogs love the walk. You do have to check the tide times if you are thinking about making this trip. It's best to walk out with an outgoing tide to get enough time on the island. Many people get caught out and the tides are very strong. 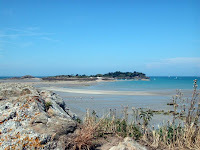 Erquy boasts 10 beaches most of which are easily accessable and perfect for families. Erquy is the main fishing port for the most delicious scallops or "Coquilles Saint-Jacques " in the region so there are plenty of lovely bistro's, cafés and restaurants lining the sea front and tempting you with delicious seafood dishes. The scallop fishing is highly regulated in Erquy and they are only harvested between October and April. If you follow the GR34 that leads you up to the cliffs on the left hand side of the village you will arive at the Cap d'Erquy which is spectacular, especially in September when this protected national park is awash with heather. There at some wonderful little bays to enjoy here but it's not for young children as the walk down to them is quite challenging (and a word of warning for the modest amongst you, one of the bays is a local nudist beach). The cliff path leads you towards the Cap Frehel which you can see in the distance.